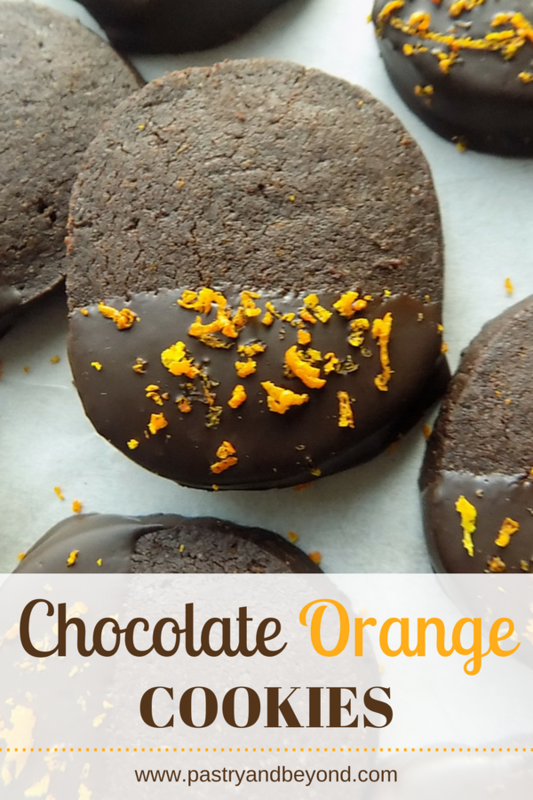 If you like orange and chocolate together, you’ll love these delicious chocolate orange shortbread cookies. These slice-and-bake cookies are crunchy and easy to make! 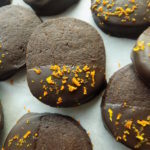 Today I want to share my cocoa cookie recipe flavored with orange zest. 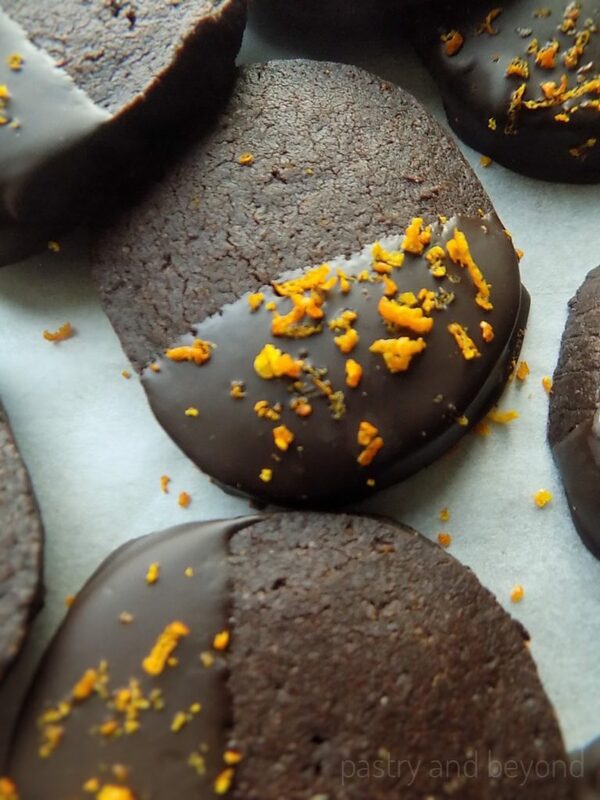 With only 5 ingredients, you end up with crunchy, lightly orange flavored chocolate cookies. 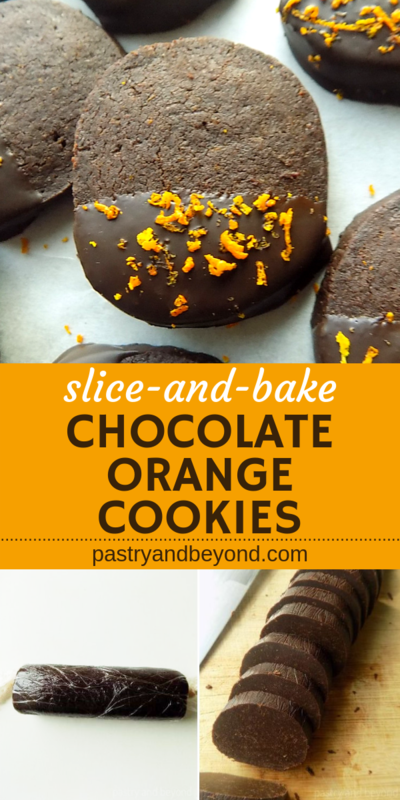 Even if you don’t like the orange-chocolate combo, you may love these cookies just like my sister. What you need are flour, cocoa powder, sugar, butter and orange zest. After making the cookies, you should dip them into melted chocolate and sprinkle some more zest on top of chocolate. After this final step, you will have delicious cookies. The other versions of these cookies are Easy Cinnamon Cookies, Vanilla Shortbread Cookies and Almond Shortbread Cookies. 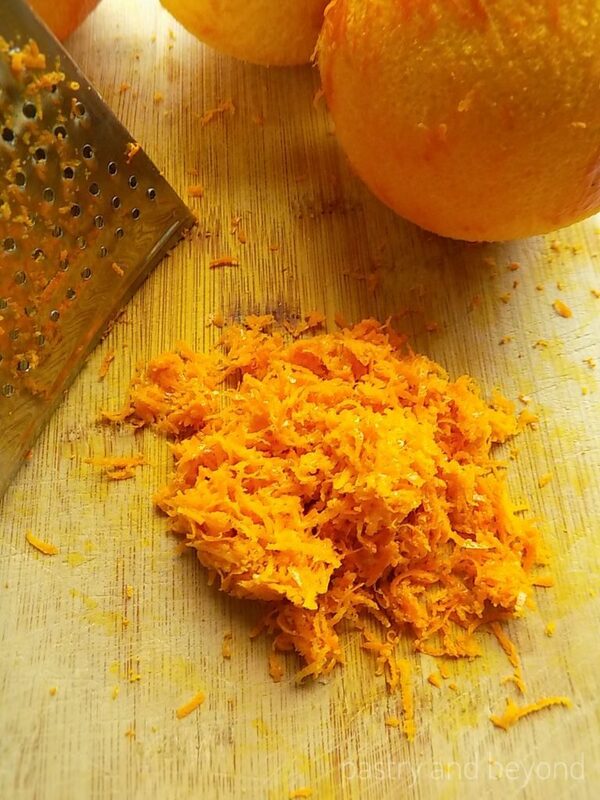 I use 4 tablespoons of orange zest. It sounds too much but actually not overloaded at all. 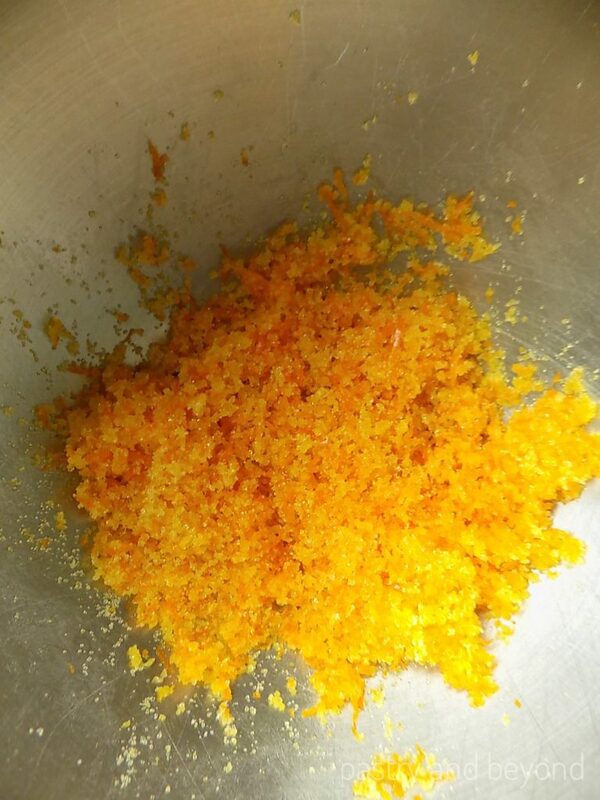 First, I put the orange zest into my mixing bowl and add the sugar. Then I mix them to bring the orange flavor out. You can either rub them with your fingertips or mix with a fork. Later I add the cubed butter and mix with paddle attachment until creamy. As I use the stand mixer, I mix the flour and cocoa in a bowl while butter and sugar are creaming. After creaming, I add in the cocoa-flour mixture and mix well. I stop the machine and scrape the sides of the bowl when needed to mix them thoroughly. Then, I divide the dough in half. I put half of the dough on a plastic film and give a rectangular shape. Next, I cover it with plastic film and roll out the dough into 6 inch (15 cm) long logs. Later I repeat the same steps for the other half. I keep them in the freezer for 40-60 minutes until they are firm. If you want to keep them in the fridge, you need to wait 4-5 hours until they are firm. After I take them from the freezer, I cut them into 0.4 inch (1cm) thick slices. Then I place the slices on the baking sheet and bake for 12 minutes. The top of the cookies will be slightly soft. I remove the cookies from the oven and keep them on the baking sheet for 15 minutes. The cookies will be crunchy and firm up as they cool. I either melt chocolate over a bain-marie or in the oven. Today I use the oven method. When the cookies are almost cool, I put the chopped chocolate into a heat-proof dish and place it into the preheated oven(210°F (100°C)). I check the oven and stir the chocolate as it starts to melt. I repeat melting/stirring steps until the chocolate totally melts. If you want to melt over bain-marie, place the chopped chocolate into a heat proof bowl that sits over a pan of simmering water. Stir often until the chocolate melts. Finally, I dip the cooled cookies into the melted chocolate and I sprinkle orange zest over the chocolate. That’s all! 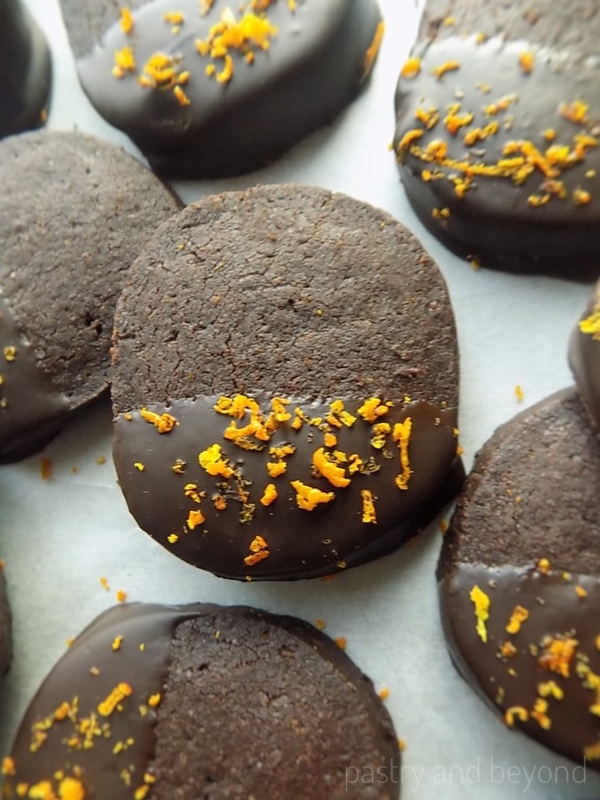 Enjoy these easy and yummy chocolate orange cookies! 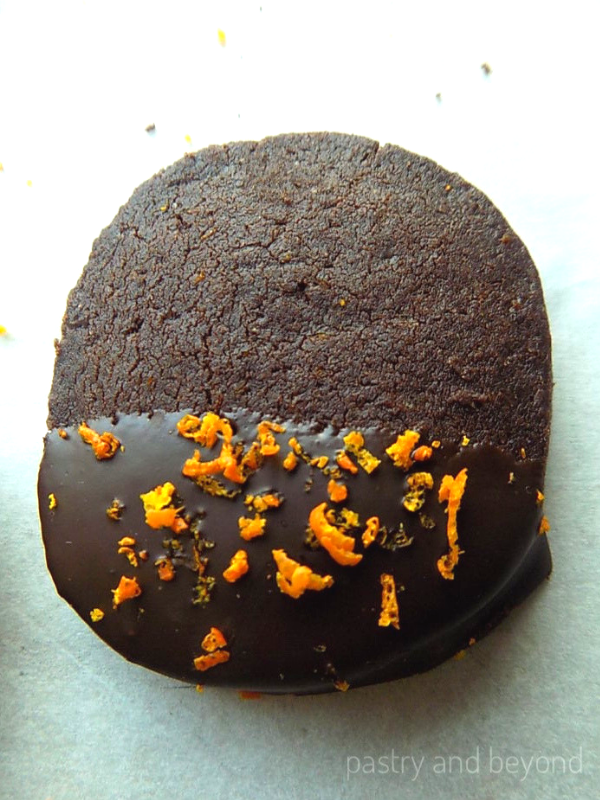 If you like orange and chocolate together, you'll love these crunchy chocolate orange shortbread cookies. Combine flour and cocoa powder in a bowl and set aside. Place the peels into a mixing bowl and add the sugar. Rub them with your fingertips or mix them with a fork to bring the orange flavor out. Add the butter and beat on medium speed until the mixture is creamy with a hand-held mixer or with paddle attachment if using a stand-mixer. Stop the machine and scrape down the sides of the bowl with rubber spatula when needed to be sure they are all mixed. Add in the flour-cocoa mixture in 2 batches and mix until totally incorporated. Divide the dough in half and place each on a plastic film. Give a rectangular shape to each and cover with plastic film. Start to roll the doughs into approximately 6 inches (15 cm) long logs. Keep them in the freezer for almost 40 minutes, or 4-5 hours in the fridge until they are firm enough. Take the doughs from the freezer/refrigerator and cut the logs into 0.4inch(1cm)thick slices. Place them on the baking sheet and bake for 12 minutes until the edges slightly change color. Remove the cookies from the oven and let them cool for 15 minutes on the baking sheet. When you remove the cookies, the top of the cookies will be soft. They will firm up and be crunchy as they cool. Melt the chocolate over bain-marie. Place the chopped chocolate into a heat proof bowl that sits over a pan of simmering water. Stir often until the chocolate melts. Melt the chocolate in the preheated oven at 210F(100C): Place the chopped chocolate into an ovenproof dish. When the chocolate starts melting, stir the chocolate. Continue melting-stirring steps until the chocolate melts. Dip the cookies into the melted chocolate. 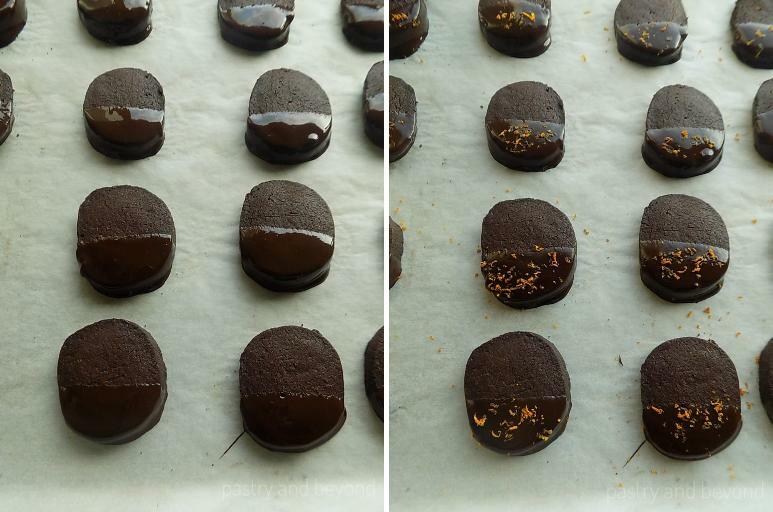 Sprinkle orange zest over the chocolate.